In clothing and home decor, I avoid white due to my unfortunate tendency to spill coffee. But in the garden, judicious use of white is striking and it often gives a focal point to the garden. That’s one of the best ways to use white in the garden. Casa Blanca lily is a stunning white focal point. Recently, I’ve been enjoying several white patches. In back, these lilies (Lilium ‘Casa Blanca’), which I bought at the MSHS booth at the St. Paul Home and Patio Show this winter, just started blooming. They are later blooming than other lilies, which may be because the spot in which I’ve planted them is too shady. I will move them this fall into a sunnier spot and remember to stake them next year. These are tall and striking, a real eye-catcher in an otherwise green part of the garden. Hydrangeas add a white burst later in the season. Near the lily is this new Annabelle hydrangea bush I planted this spring. Here’s a case of putting the right plant in the right place. Ever since it was planted in this somewhat shady spot, it has looked healthy and happy, and for the past few weeks, it’s been putting out bunches of white blooms. 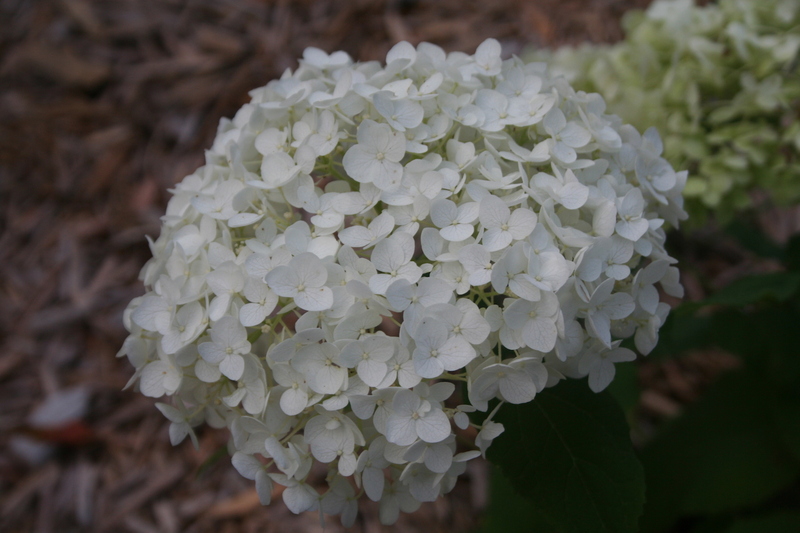 Annabelle is an old-fashioned hydrangea and will get 5 feet tall and wide. It makes a lovely hedge and is a reliable bloomer as far north as USDA Zone 3. 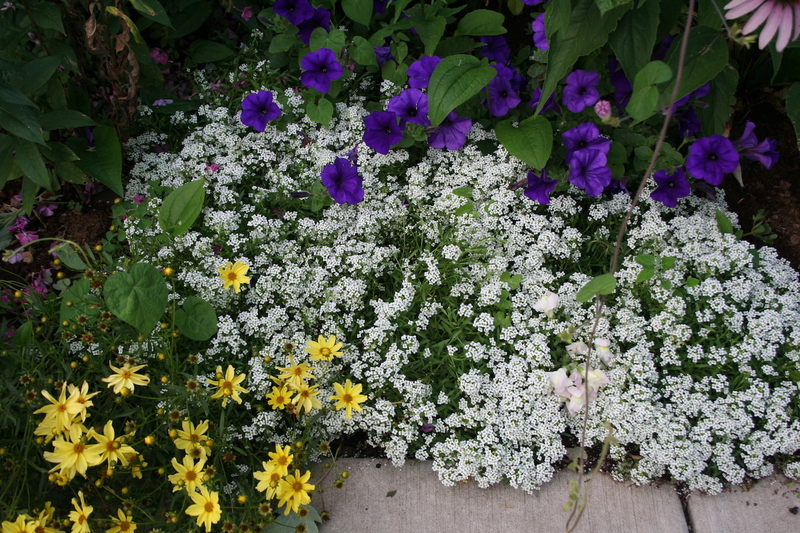 Alyssum is a classic way to add a white light to the edge of a garden bed. Finally, in the front-door garden, I have white sweet alysum. I’ve had poor luck with alysum in the past, but this year’s relatively cool conditions have been perfect for it. The white color contrasts well with the deep purple of these Wave petunias and the sunny yellow of the coreopsis planted near it. Some gardeners choose to isolate white in one part of the garden and this can be beautiful, especially at night. If you’d like to try a white garden, check out this article on principles of designing with white. I believe Casa Blanca is by nature a late bloomer. It’s the last of my lilies to bloom as well. Thanks for linking to that piece on white gardens. I never could keep to such a strict color restriction myself, but when well done the white themed gardens really are exquisite. I was lucky to visit the one at Sissinghurst which is probably the most famous and incredibly well executed. 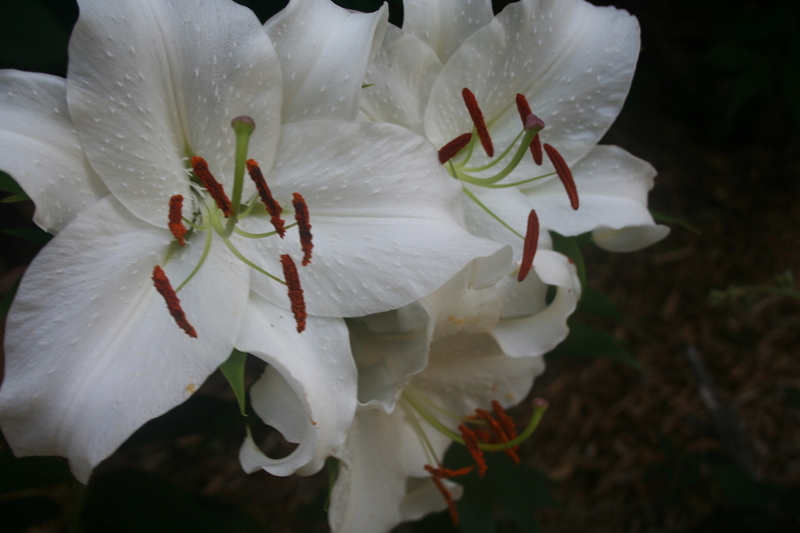 Casa Blanca is the most heavenly lily in terms of scent and sooo regal — tall and elegant. Well worth growing! Enjoy it! !